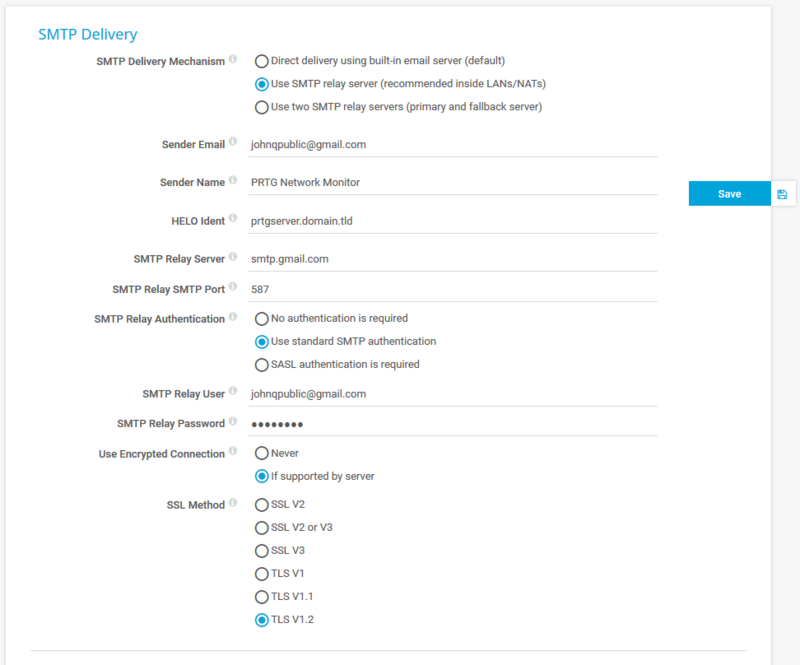 SMTP Delivery in PRTG works in Automatic SMTP Delivery Mechanism, but I wanted to know why it doesn't work if I enter the SMTP server relay info myself (same account info). Same SMTP / account information also works in the sendemail.exe utility you can find online. Is there something I'm missing as to why it won't work on PRTG? We successfully tested a Gmail address / Gmail SMTP server for sending out email notifications with PRTG 17.4.33.3251. In the PRTG web interface, select Setup | System Administration | Notification Delivery from the main menu, and use the settings as indicated in the screenshot below. Note: Make sure you replace the user part of the email address by your own Gmail username (twice). When using a Gmail hosted address, use username@hostname.tld. Note: The settings are similar in PRTG versions 13 through 17.4.33 and previous. We successfully tested the PRTG email delivery with Google Apps (aka G-Suite) using the following setup that is probably the same for plain Gmail accounts. Very important: You need to change a setting for the Gmail/Google Apps account that you want to use for sending emails over SMTP. The setting is Allow less secure apps (see this page for more information). Alternative: If you have activated two-factor authentication (2FA) for your Google account, there is an alternative to the Allow less secure apps setting. Generate a dedicated app password for PRTG as described on this page. To test the new settings, open Setup | Account Settings | Notifications in the PRTG web interface, select an email notification, and click Test email notification. PRTG will try to send an email immediately. If you have any problems sending emails, please check the PRTG Logs for respective entries. Make sure your firewall settings allow a connection on port 465 or 587! Please also see Configuring other mail clients from GMail help. Tried it and worked. Thanks. Hi, We have just recently installed prtg and we still can't send out notifications. Even after changing to the above settings we still get the 'Error sending "Email": Connection failed ("smtp.gmail.com")" message. I have left the HELO Ident with the default settings -WIN-JN6NM66AF2G. Not sure if this is the reason for this. Hope you can shed some light. Currently running PRTG Network Monitor 13. Tried to use my Gmail account based on the information supplied above for "Setting for PRTG 9" but it continued to fail. After researching it a bit further, found that there is another port "587" that can be used for the SMTP Relay SMTP port. Updated new port, saved changes, tested and received the notification as desired. @ppatullo: Thank you for the information! I have configured as per above recommendation, but still negative result. Which exact error message do you receive within PRTG? We recently ran into this error ourselves and found that you would have to enable option "Allow less secure apps" in your gmail settings at this page. This is currently the only way to get an POP/IMAP sensor to connect. You will also need to white-list the PRTG server to use the GMail account as a relay server. The configuration is described on this page. Meanwhile, could you please advise where can i extract relevant information and send it to you? You can write an email to support@paessler.com, this will create a support ticket and me or one of my colleagues will answer your inquiry by email. Thank you! Port 587 works for me. Messages were sent successfully in PRTG Version 17.4.33.3251 with the set-up above. Messages were also sent successfully in PRTG Version 17.4.33.3251 using a per-app password with a 2FA account.